“It’s completely different to the Cranberries – very experimental and out there. A couple of tracks have a David Lynch movie soundtrack feel, but they’re fully developed songs,” Dolores told Hot Press magazine in 2003. “Evilenko” is the fruition of those solo pieces. In fact, Angelo Badalamenti is a long-time collaborator with David Lynch; and together, the team masterfully created the soundtracks to films such as Twin Peaks and Mulholland Drive. 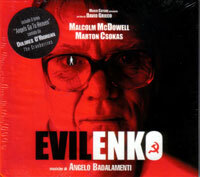 “Angels Go to Heaven,” the opening track to the “Evilenko” soundtrack, sets the ominous tone for the rest of Angelo Badalamenti’s haunting 11-track soundtrack to the film. As the synth notes begin to play, Dolores O’Riordan’s airy aahs drop in, rivaling the resonance of the trembling vibrato of the synthetic organ pipes. Immediately, there is a contrast to the cold, eerie synth as the humane element in Dolores’s voice is introduced — a contrast of indifference versus compassion that will last throughout the song, if not the entire soundtrack. But make no mistake, “Angels Go to Heaven” is by no means the warm, sweet Dolores O’Riordan that we have heard in familiar ballads such as “Dreaming My Dreams.” This is O’Riordan sounding more tortured and troubled than she has ever before comitted to tape. “Adiuva me, Sanctus Spiritus,” (“Help me, Holy Spirit,”) she meanders in a melody that is more Gregorian than modern. Indeed, there are a number of parallels that can be heard here with her last film project, singing Schubert’s “Ave Maria” for the Songs Inspired by the Passion of the Christ soundtrack. But this composition is Badalamenti and O’Riordan’s; and it is every bit as chill-inducing as as Shubert’s. The song is almost too appropriate for a suspense film about the Ukranian serial killer Andrei Chikatilo, who targeted at least 53 people, mostly children, over the span of 12 years. “No way out, no comfort for those who lost love… no way out, this is eternal pain,” she pleads in a slow, calculated pace until it erupts into the operatic “Adiuva me, Sanctus Spiritus,” where O’Riordan shows her vocal prowess unlike ever before. Some of the tracks on the album consist only of slow, unwavering synth with English dialogue as a blanket. Granted not every track in a film score can be a highlight; and here, it is only the presence of the intense dialogue that makes some of these tracks worth a listen. “Vadmin’s Neverending Quest,” track four, is a departure from the foreboding synth, with a guitar interlude and more orchestra synth. This track provides a glimmer into what is otherwise a dark soundscape. Track 5, “The Woodstrip/There’s No Way Out,” is O’Riordan’s second appearance on the soundtrack. This time, her voice is mixed with a grim reading of the names and dates of Evilenko’s victims. Phrases like “11 years old” and “the fourth of April” puncture the surface, piercing through O’Riordan’s vocals for a dramatic effect. The “Theme from Evilenko” is an instrumental version of “Angels Go to Heaven.” It is a lighter, orchestral take on O’Riordan’s vocal melody. It begins with a flute and broadens as large, cinematic strings steal the focus. Though she is not credited on the song’s tracklisting, O’Riordan also appears on track 10, “The End of a Madman.” The main melody here serves as a compliment to “Angels Go to Heaven” without being a reprise. Dolores’s “adiuva me” resonates faintly in the background. To correspond with the film’s drama, there is a sense of comforting finality to this track as the mood revolves around the cinematic emotion of Evilenko being caught and punished. As a final treat, the soundtrack ends with “Angels Go to Heaven (Full Mix),” a beefed up orchestral mix of the title track. The electric bass and shimmering cymbal are a few of the welcome additions that make this a suitable end for the soundtrack. Perhaps the most telling moment, however, is when O’Riordan exhausts her final, low “oooh“. Here, a scintillating cymbal rises up; and “Evilenko” comes to a close. The “Evilenko” soundtrack is available now in Italy on the Minus Habens Soundtrack Collection label. We also have an extra copy of the soundtrack available on eBay if anyone is interested. While waiting for a possible and much-hoped for new album, The Cranberries offer “Live” for us to spend the winter. Not completely new, this DVD plunges us back into the environment of the mid-Nineties. It is true that the rock’n’roll so characteristic of the Cranberries evokes a crowd of unforgettable memories in us, particularly with the listening of the traditional track “Zombie”, which was incontestably the most significant hit of the group in the middle of the 90s. Ten years later, Dolores and her comrades returns to the DVD shelves this winter with a disc simply entitled “Live”, composed of a series of titles recorded during a concert given at the London Astoria II, a famous room belonging to the same house which in particular saw ravelling on its scene U2, David Bowie and Oasis. “Live” is quite simply a beautiful scenic experiment undertaken by the Irish group, certainly one of best given during their career. The quartet is shown there in form, in sometimes powerful environments, sometimes calmer, in airy rock’n’roll roles. It is a true happiness to view the performances of “Linger”, “Zombie” and the poignant piece “So Cold In Ireland”. We regret simply the absence of some interesting bonus extras, which would have been welcome, but the live performance of the Cranberries largely makes up for it. Undoubtedly, this DVD is to be added to the beautiful collection of the group, which already counts, among others, the superb Live in Bercy [Beneath the Skin].